Sketched in pencil and watercolour pencils. Scrivener Albertus is another character from the same Dark Heresy campaign as Jek’la. Playing role-playing games makes me want to draw! And again, for no particular reason, I will supply you with a brief description of this character. 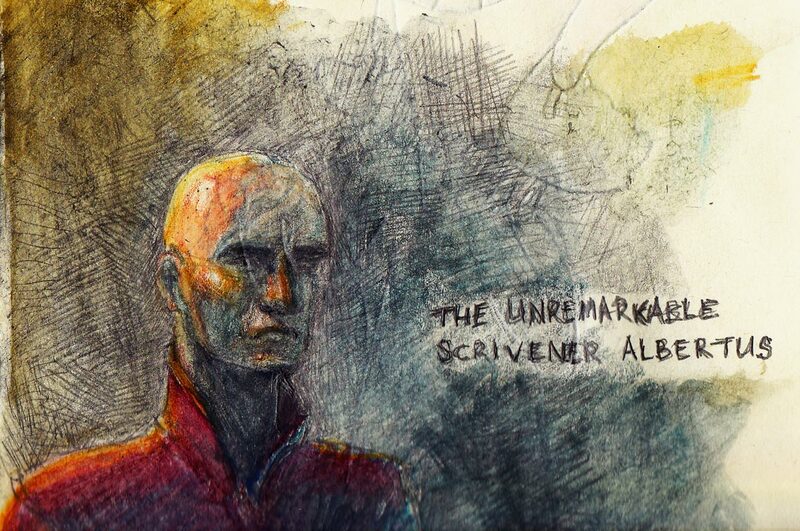 Scrivener Albertus is an Adept/scholar from an Imperial world. He is a dry, stiff, stubborn, discriminating and greedy man (A good source of conflict with the other characters in the campaign, if a little boring). Albertus is keen to accrue power. His primary goal is to gain in power and authority while maintaining his public anonymity through obscurity; climbing the career ladder to the top through clever book-keeping, clandestine maneuvers, political opportunism and highly deniable deligation. Preferably without anybody noticing. He’s very good at that – people find it oddly difficult to recall his existance at all. An Inquisitor, in an unlikely moment of opportunity, hand-picked Albertus to be part of a team of detectives in a secret war to hunt out heresy. Albertus seeks to be recognised by his charge for demonstrating leadership, cunning and methodical detective work. Albertus also provides personal administrative and managerial services to the upper echelons of Imperial society to pay his way. This is how he met Jek’la. Albertus, an enterprising fellow, has applied his studies of biochemistry and pharmaceuticals to experimentally manufacture various drugs for his new teammate Jek’la, who eagerly volunteers to trial his concoctions. Who know’s, perhaps if something works he can patent it, for the Emporor, naturally.